A Special 2008 Anniversary Report from New York! Happy Anniversary to Pokémon Rebirth and all who have been a part of it in one form or another, those who have contributed to the site and to those who are still fans after a great seven years! 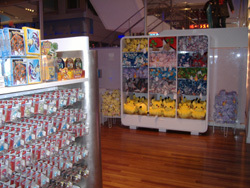 the shop had to shift from being mainly oriented towards plugging the yellow electric rodent, to showcasing the other products that Nintendo has to offer. 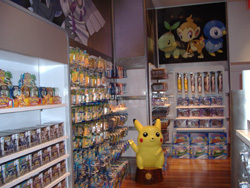 Still, there is a collection devoted to pokémon, comprised of a few display cases and a corner of the main floor. But there was more to it, as there was a feeling of anticipation in the air. 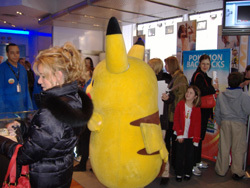 various pokéworlds can take place without a visit from the electrifying presence of the world famous Pikachu? release, held on the 9th of November, was a great way to re-attract attention to the store, as many people who otherwise wouldn't be here now, came to be a part of the proceedings, and of course sales were boosted due to the extra attendance, and attention. 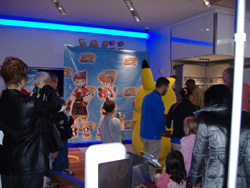 For confidentiality reasons, I was not allowed the actual sales figures of the day, but was told that it was far more than expected, as many more units of the game had been sold than the staff were anticipating, not to mention other games and products riding along in the wake of the pokémon powerhouse. A new music making Wii game (Wii Music) was attracting attention, as were other Pokémon games such as Diamond and Pearl and Mystery Dungeon. Before I concluded my time at the store, I felt tempted, and so managed to get myself some time with the star of the show. A brief interview with a photo were in the works. 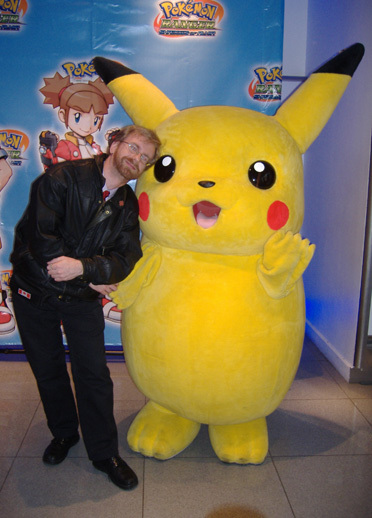 Pokémon Rebirth: "It's a treat to meet you at last Pikachu. I hope you're not too tired from all your fans..."
PR: "Oh, so this doesn't bother you?" P: "Chu." *still smiling, shakes head* "Pi, pika-pi kah chu, chu pi kapi pipi chu-ka. Kah pi kachuka pi-chu-kah." *tilts head and looks at me questioningly* "Chu kapi chu pika?" PR: Umm, yes I see. By having this game focus on other characters, it enables people to gain experience with the other pokémon out there and doesn't put as much pressure on yourself to constantly perform and thus allows you to focus more on other pursuits such as your television and movie career." PR: "You don't find that being too superficial?" PR: "Well do you have any words for those at Pokémon Rebirth who have been eagerly following your adventures and being inspired to create and enjoy their own stories based on what you've managed to do over these past several years?" P: "Pi!" *Big thumbs up, followed by the two-fingered Peace symbol* "Chu pika, pi-pikachu chu-kah, kakapi-pikah chupi pi-chu-kah. Pikachu pi-pi-pikah chupipi, chupikapika chu, chupi kachuka." PR: "Try to be prepared for whatever may lie in store, because nothing truly happens without some sort of warning, no matter how small. Use this and build on it, and it'll serve you well." *nods in understanding* "Pretty deep, and--"
P: "Chu-pipi kah chu, chu... chu-pipi kah chu, chu" *store staff members start to gather 'round and all join in the singing* "Happy birthday dear Pokémon Rebirth and friends! Happy birthday to you!" PR: "Can I get a photo?" PR: "Thanks, I appreciate that." PR: "Well yeah, I guess I have learned to understand languages fairly well." PR: "Oh? Alright, I think the Rebirth readers would enjoy a joke." P: "Ka pika ka chu, pipi chuka kah?" PR: "Umm, I don't know, what did Jessie get when she looked in the mirror in the morning?" Sizzlingly submitted for Pokémon Rebirth by ~silvester.